Yesterday we learned that London-based architect Zaha Hadid had rethought her design for Tokyo's Olympic Stadium, after widespread protests and a major budget cut put the original design in jeopardy. Dezeen has the new images of the redesigned stadium, and it's... pretty damn similar, despite a $1.3 billion budget cut. 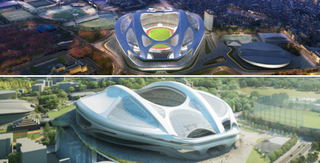 Dezeen says these renderings were released by Hadid's office, showing a stadium that cost $1.3 billion less than the old design—after the The Japan Sport Council announced a plan cut the cost of the stadium from $3 billion in May. But more than the budget, the architects say this design responds to widespread criticisms of the previous design: That it was too big for the site, that it didn't respect the surrounding public space, and so on. According to Hadid's office, the rethought design will "optimize the investment and make the stadium even more efficient, user-focused, adaptable and sustainable." So how do you pull $1.3 billion out of a building and still make it look fairly similar to the original? In all likelihood, a ton of fat-trimming is going on here. But major changes to the podium and roof are afoot too: Hadid's original had a swooping, structural web that looked bulky as far as materials were concerned. The new roof, while maintaining some of the original geometry, is made from a "lightweight, tensile fabric between the stadium's structure" that "significantly reduces the weight and materials of the roof, giving the stadium even greater flexibility as both an outdoor and indoor venue." That seems to be a nod to another major criticism of the original design: That it would be hard to reuse once the games are over.